Today is the grand opening of the Pets on Quilts Show. I am happy to announce my entry. I am calling the quilt "Minnie's Puppies." For those of you who don't know, Minnie is my pet sock monkey and she is a mini-sock monkey. 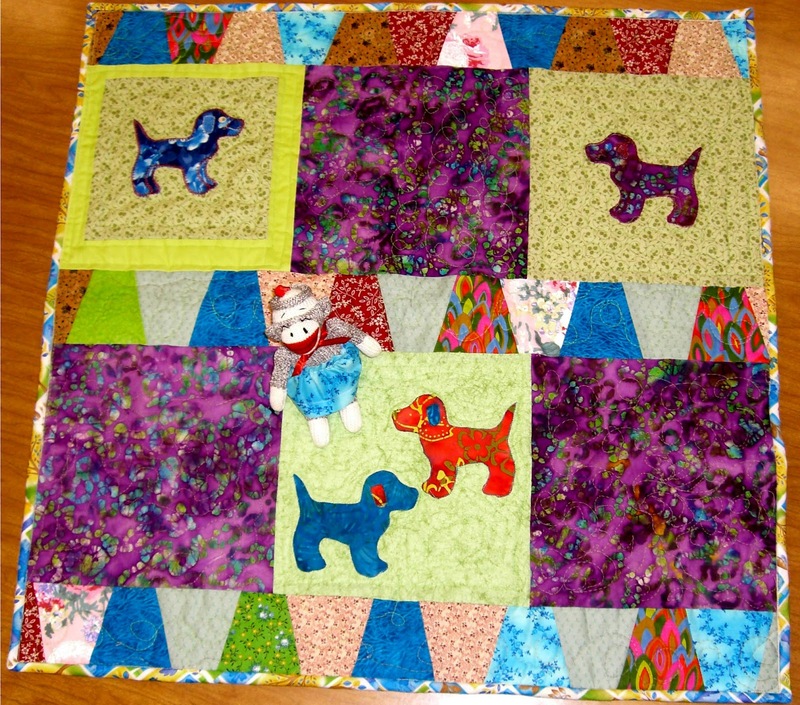 She loves puppy dogs, so she asked for a quilt with dogs. I made the puppy dog applique blocks using my AccuQuilt Go! cutter. The single ones are embroidered using files that I got from Marjorie at Marjorie's Quilting Bee. The block with two dogs was done with a simple narrow zigzag. Here is Minnie on her mini-quilt - but for her it is HUGE. Look at this big smile! I think she is really happy with her quilt. She reminded me that she was "Ready for my close-up, Mr. DeMille" so I took this close up. She had to get some love from the puppies. She is fond of Blue Dog. But she is in LOVE with Purple Dog. Be sure to go to the Pets on Quilts show post and visit all the links to see all the quilts. Then be sure to Vote. Minnie and I would love it if you voted for us! Minnie said that I should command you to vote for us. I had to tell her that it was not nice to be bossy. She is a bit of a wild child. I don't know if I will ever tame her, but I am trying. Adorable quilt. Good luck training Minnie. My daughter never did get her sock monkey Steve trained. He roamed her house and even rode her armadillos! Lol! What a cute quilt for an adorable little sock monkey. It's so hard to train sock monkeys, I think it's the sock part, we know how much they love to roam and disappear. So cute- never knew sock monkeys were so fun! Wonderful quilt! Love the sock monkey! Happy quilting!!! Love Minnie, and her quilt is wonderful! Good luck in the competition, and in the giveaways! love your quilt. I played around with Marjorie's dog pattern the other day..turns out grea! Those doggie cut outs are adorable, I can see why Minnie is smitten with them! Cute post, Gene. Love Minnie. Good luck with her training. Nice use of your Accuquilt GO! too. I have those dies. Hmmmm. Thanks for inspiring me. Tumblers and dogs -- great combo. Minnie and her little quilt are adorable! Oh Gene, you make me quack up. Too cute. Gene, there is a little bit of "Monkey Business" on this post if you ask me. That aside, your quilt is adorable. Love the puppies. Your quilt turned out very cute! Minnie looks very cute with the puppies. 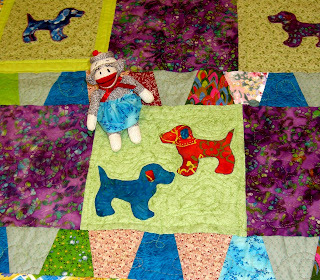 Loved meeting "Minnie" and such a Dog-gone CUTE QUILT! Oh Gene. Your work always makes me smile. I'll give up the purple dog for the teal.....grin. Can't decide which is cuter....the quilt or the pet. Delightful! I have not got a die cutter- You sure do make fun creations with yours. What a fun post! I love the red puppy, will that make her jealous? Thank you for sharing with us. Cute quilt and like those batiks. My sister crocheted a kid sized sock monkey for my grandniece. I love to play with the grandniece and her sock monkey. You are a GO! pro. Your sock monkey is safer with her puppies than with mine...30 seconds to disaster for anything stuffed still at this point! I love it! Minnie looks so happy with her puppies! Monkeys can be bossy! But, since my nickname was (and still is...) Monkey, they still have a spot in my heart. I like the red dog the best I think Minnie! That is a really cute quilt and a very happy sock monkey. Who would think they could be so fussy? What a precious quilt Gene! Minnie does look like she is in love LOL! I never thought of having a sock monkey for a pet....brilliant! Even if they are a little cheeky. Cute quilt. Purr purr from Rusken to you. I have quite a few bossy sock monkeys in my life, so I know how they can be. At first glance the pups literally jumped out and I thought they were 3d embellishments (like charms) on the quilt rather than part of the fabric itself. Off to vote, love the tumblers! Minnie looks quite happy, and I have to agree with her that purple puppy is too cute! Adorable quilt! I have never owned a sock monkey and had no idea they were so bossy! 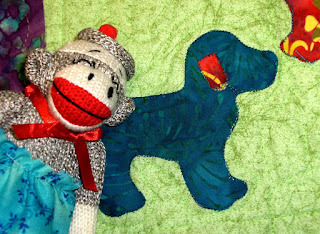 Cute quilt and an adorable sock monkey. Yup! The purple pup is my favorite too!!! I love it you did a really good job. The quilt is wonderful and Minnie is so cute! Minnie obviously loves everything about her quilt, and I'm not surprised, it's such fun. LOL, Minnie I like the purple dog too. Love those pups - and Minnie too. You always put things together so well--your quilt top design is great. creative way to use the parts you gots! very cute puppies! I love the red one! Wow, that was some work! The dogs are very cute! 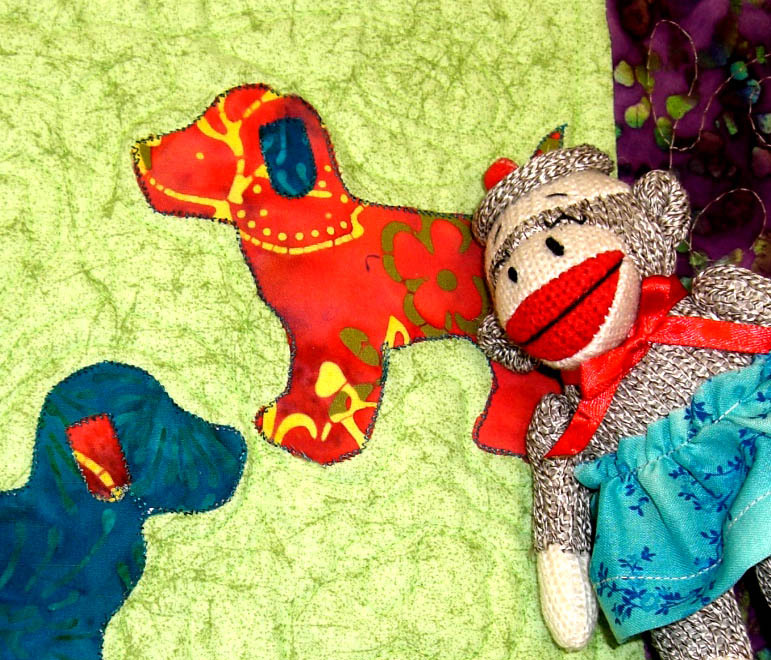 I love the puppies in your quilt and choice of fabrics for them. I can see why your wild child loves the purle the best, thats my favorite too ;) Good luck in the contest. What a gorgeous quilt. I love the colours and the way the puppies stand out so well. 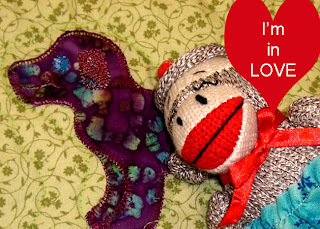 I love the quilt and Minnie is a cute sock monkey. 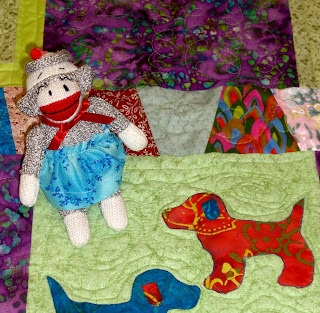 Love the quilt and the sock monkey! Very cute little quilt... but Minnie is adorable! Oh!!! Me loves the doggies on the quilt! And the monkey reminds me of mune!